Evendine House is in a tranquil location set in the Herefordshire countryside. The building is situated in the picturesque village of Colwall and has 2 acres of landscaped gardens with beautiful views of the Malvern Hills. With its distinct country home feel, Evendine House offers quality care in a comfortable and relaxing setting. 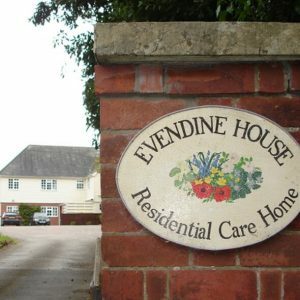 We are able to accommodate for up to 20 residents at Evendine House. As a result of this, the house has a very homely and warm environment that helps residents to settle in fast and easily connect with others. This environment also enables our wonderful care team to give greater attention and care to each individual resident. We work hard to ensure that our residents are happy, comfortable and satisfied at all times. Our focus is to make all residents and their families feel truly relaxed and at home. We also pride ourselves in delivering high quality personalised care. 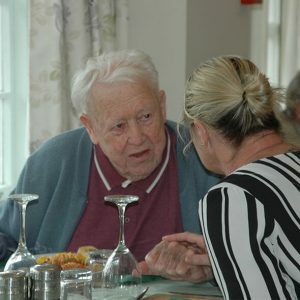 At Evendine House, as well as shaping our care and services to each resident’s often changing individual needs and requirements, for those living with Dementia we also offer them specialist care. We recognise the complexity of the condition and that Dementia presents differently for different people. Our experienced care team understand the importance of food, nutrition, mental stimulation and exercise for those living with Dementia. We aim to improve the quality of life for dementia residents by ensuring that we provide healthy and nutritious food as well as high quality activities and events tailored specifically to the resident’s individual needs, wishes and capabilities. At Evendine House there over 2 acres of land for our residents to enjoy. We have beautiful landscaped gardens with flowers and plants of numerous varieties as well as views to the Malvern Hills. We encourage our residents to stay healthy and active and frequently plan events utilising our wonderful gardens. With staff there to support and keep company, our residents are able to explore the grounds safely. So whether it is a leisurely walk around the gardens, a family celebration or a sit outside to enjoy the sun – our beautiful gardens are the perfect backdrop for it all. 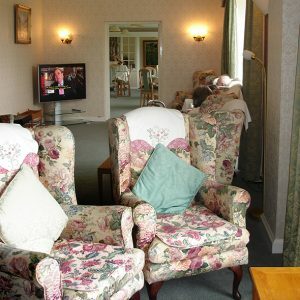 We have several warm and friendly community areas at Evendine House. In our larger community areas, we host all of our daily activities and events. These larger areas are also commonly used by our residents for socialising and interacting with others. We also have smaller and quieter spaces where residents are able to relax in private. At Evendine House we are passionate about providing a ‘home from home’ environment in which our residents feel happy and relaxed. We work in partnership with our residents and their families to ensure that their needs and requirements are identified and catered for. Our caring Activity Coordinator plans frequent events throughout the year that centre around our residents’ friends and families. 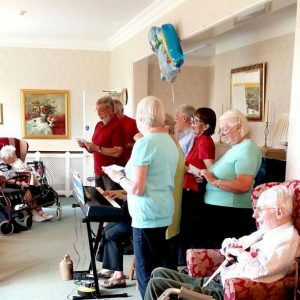 We also have daily activities and events that encourage our residents to socialise and interact with one another. This could be from conversing over dinner to sharing stories and memories from the past. Evendine House caters for up to 20 residents which enables us to offer a more personalised and attentive approach to care. This enables residents to become familiar with staff members and fellow residents, thereby helping them form friendships quickly and settle into their new home with ease. We ensure that all of our staff members are highly skilled and qualified in what they do. We recognise the importance of continual professional development and provide staff with regular training to further enhance their knowledge and skills. Our excellent care team work closely with the same residents to provide continuity of care. This also helps our care team gain a greater understanding of each resident as an individual, in addition to becoming familiar with their needs. We offer free dining to all of our residents’ family and friends. From delicious afternoon tea to a healthy and home-cooked dinner, family and friends are able to enjoy high quality cuisine no matter what the time of day (we just ask for a little notice where possible). By doing this, our residents and their families are able to spend even more quality time together. Family events and celebrations such as birthdays and anniversaries are warmly welcome and we will do our best to accommodate these. At Evendine House, our residents’ families and friends are always welcome, which is why there are no set visiting times. This enables our residents to enjoy the company of their friends and family any time. The flexibility and openness that this provides is extremely helpful for families that are restricted by work commitments. We also provide families and friends with free afternoon tea and dinner so you can even join your loved one during meal times.